The African continent has the world’s youngest population, especially in Sub-Saharan Africa, with 43% of the population aged below 15. The health and development of this young population, especially girls, who face particular challenges as they go through puberty, are key to the development of Africa. Investment needs to be made to ensure that Africa can benefit from the population dividend. Today in Africa, this population group faces multiple challenges, from infectious diseases to under-nutrition to non-communicable diseases and mental health issues. Interventions need to be designed and provided through a multi-level delivery system that includes family, school, and the broader community in collaboration with both the public and private sectors. 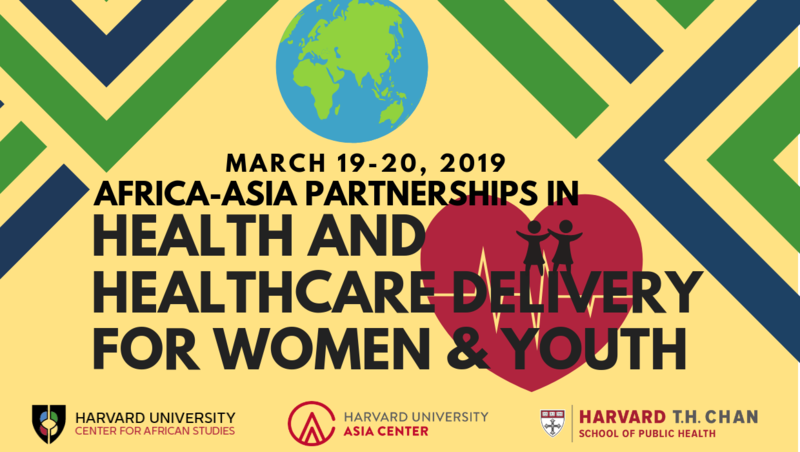 On March 19-20, 2019 the Harvard Africa-Asia Initiative will hold its second international conference in Johannesburg. The first was held in Shanghai on November 16-17, 2017. The Africa-Asia Initiative has facilitated collaborations between Harvard schools, centers, libraries, and museums in ways not previously imagined. Partner institutions for the Harvard Africa-Asia Initiative include the Center for African Studies, the Asia Center, the Fairbank Center for Chinese Studies, the Reischauer Institute for Japanese Studies, the Lakshmi Mittal and Family South Asia Institute, the Korea Institute, the East Asian Legal Studies Program, and the China-Harvard-Africa Network (CHAN) at the T. H. Chan School of Public Health. The Africa-Asia Initiative has three major foci: migration, trade, and aid; environment, science, infrastructure, and industry; and partnerships in health and healthcare delivery. These areas relate not only to student and faculty interest and expertise but also represent the key themes driving Africa-Asia partnerships. They are thus at the center of our teaching and research. The two-day conference will convene scholars and policy makers across disciplines from Harvard, Asia, Africa, and the rest of the world. We intend to share research findings from across Harvard and other institutions to exchange ideas and thoughts, and to discuss ways to move the agenda forward for safeguarding the health and development of women and youth in Africa. The conference will be co-hosted by the University of Witwatersrand and the University of Johannesburg.